A wastewater treatment plant in Blue Springs, MO replaced 2 of their 4 PD blowers with integrally geared turbo blowers in a nitrification-denitrification process. This resulted in over 35% less energy used by the integrally geared centrifugal blowers along with improved process control. Phase 2 replaced the 2 remaining active rotary lobe blowers with an additional pair of integrally geared turbo blowers, this pair having about 7% higher flow capacity relative to the first pair, and resulted in over 40% energy savings relative to the rotary lobe blowers. This total energy savings can be broken into 2 components: energy saved due to increased wire to air efficiency of the blower package and energy saved due to process improvements. 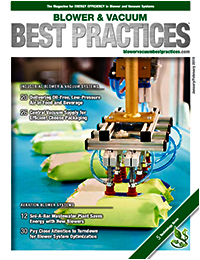 It is estimated that wire to air efficiency accounts for approximately three-quarters of the savings while process improvement accounts for one-quarter of the total savings. This blower replacement was partially funded through an Energy Conservation Grant and the energy savings were independently verified by a third-party. An Ohio WWTP replaced its multi-stage centrifugal blowers with Inovair direct drive Modular (IM) model integrally-geared turbo blowers. The high efficiency blowers and improved dynamic control reduced the plant’s annual energy costs. In 2016, the wastewater aeration system was consuming approximately 50% of the total electricity at the Pickerington, OH plant. Knowing Inovair’s direct drive Modular (IM) model integrally-geared turbo blower provided the lowest total cost of ownership over other High-Speed Turbo Blowers Pickerington reached out to Inovair to apply their solution to lower the existing power costs and improve DO control. The existing blowers operated at a constant speed and used an inlet throttling valve to regulate flow. The existing blowers had been moved into the new blower building in 2010. However, the three (3) 100 HP existing blowers were difficult to control, very inefficient, and had limited turndown. Because of the compact footprint, self-contained motor, and ability to use the existing electrical and discharge piping/components the City of Pickerington chose to act as their own General Contractor to install the more efficient and dynamically controlled Inovair Blowers. The goal was to reduce the annual energy costs of the blowers as well as improve DO control which would additionally help lower energy use. The plant had three (3) constant speed 100 HP multi-stage centrifugal blowers two (2) multistage blowers ran 24/7during the summer and one (1) ran during the winter, delivering a maximum of 2750 SCFM throughout the year. The existing multistage centrifugal blowers had a design flow of 1375 SCFM each at a discharge pressure of 8.50 PSIG. These blowers were constant speed and utilized an inlet throttling valve to control the output flow. This limited control of the blowers allowed the DO levels to fluctuate as ambient conditions changed. Utilizing Inovair’s selection software it was determined the Inovair IM integrally-geared high speed turbo blower could meet the same design conditions with 75 HP blowers and upon installation the plant could immediately reduce their blower’s power consumption by over 25%. 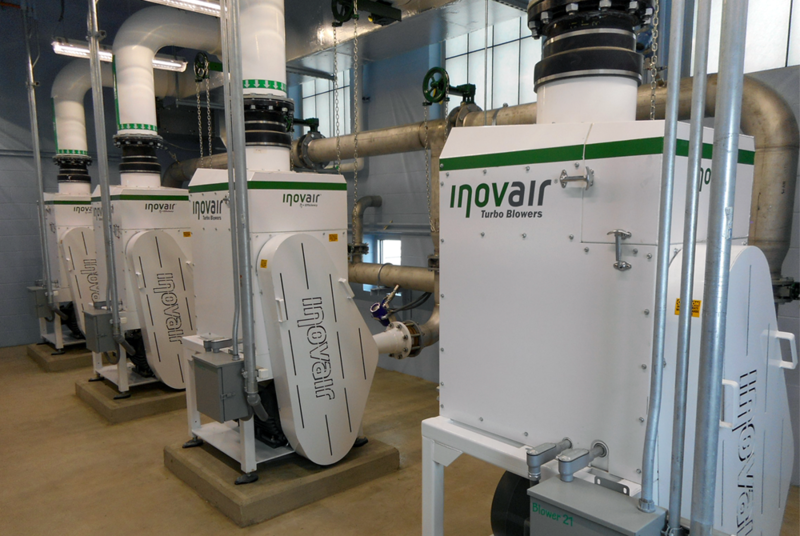 The Inovair direct drive Modular (IM) model integrally-geared turbo blower turndown range gave the plant operational flexibility that was not previously possible; additionally, the onboard PLC which automatically controls the blowers’ airflow based on ambient conditions was able to tighten up the fluctuating DO levels in the aeration basins. This control ability resulted in less airflow with limited operator input thus contributing to the overall blower system efficiency and cost savings. Thanks to Inovair’s blowers’ energy efficiency and a dynamic control of airflow the energy consumption went down by almost 350,000 kWh, reducing energy bills by over $26,000. Combining the low initial capital cost, installation costs, and energy savings the payback was substantially faster than would be possible with other blower technologies. The Valley Center WWTP in Escondido, CA replaced the PD blowers on their digester with more reliable and energy efficient Inovair (IO) Integrally Geared Turbo blowers. The Integrally Geared Turbo Blowers drastically improved the reliability of the process while substantially reducing the power consumption. In 2013 Valley Center started an evaluation process to replace their existing 75 HP PD Blowers. The existing blowers were only a few years old but were experiencing frequent down time and becoming a drain on the maintenance budget. In order to replace the existing blowers with more reliable blowers the utility decided to evaluate different blower technologies including PD blowers, gearless turbo blowers, and integrally-geared blowers, for the best solution. The utility would buy one unit at first and if their evaluation proved true would by a second unit within one year. The evaluation process would compare capital cost, power consumption, reliability, and design flexibility. Additionally, the digester process would require blowers which could reliably operate with varying water depths, from 8’ to 24’, as well as daily starts and stops. After thoroughly reviewing all five (5) proposals and even conducting a plant trial with one of the competitors Valley Center chose Inovair as their blower supplier. The Inovair (IO) blower’s competitive price, compact size, high efficiency, reliability, and flexibility were all deciding factors in the in the selection of Inovair. The Inovair (IO) Integrally Geared Turbo blower’s compact size, W34" x L40" x H71", was a perfect fit for the eighty-six square foot blower room and could be easily installed through the 36” man door without any disassembly. 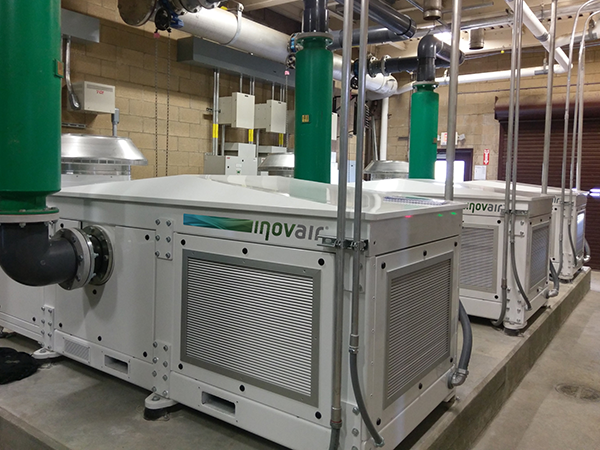 The high adiabatic efficiency of the Inovair (IO) ensured a quick return on investment. Inovair being the only high-speed turbo blower which uses industry standard Variable Frequency Drives (VFD) and motors, allowed Valley Center to procure and use their preferred VFD. According to the plant operator “The ability to locally source the VFD and motor gives you piece of mind.” Additionally, the Inovair Blower was able to meet the required flows with a 60 HP motor. This was a 20% reduction in installed HP from the existing blowers as well the custom-built motors of the PD blowers. This product flexibility coupled with the reliability of the non-contact oil-film bearing and proved to be the best choice for Valley Center. After six months in operation Valley Center purchased a second Inovair IO blower package, and after 5 years in operation and over 2000 starts/stops the Inovair (IO) Integrally Geared Turbo Blowers have operated flawlessly in this tough application. The Inovair (IO) Integrally Geared Turbo blower is not only robust but also efficient, reducing both maintenance and operational costs. In 2013 Nixa, MO WWTP replaced its positive displacement (PD) blowers with more efficient Inovair (IE) model integrally-geared turbo blowers. The high efficiency blowers reduced the installed horsepower required by the existing blowers while reducing the noise level. The Nixa facility was also able to maintain low installation costs by reusing the existing MCC and installing the Inovair blowers outdoors in the same location of the old blowers without any additional expensive canopy or blower building. In 2013, Nixa’s wastewater digester system was overtaxed due to the rapid population growth of the area. To treat the increased capacity, additional diffusers and additional blowers were needed. Because the existing PD blowers were noisy and inefficient, Nixa wanted a more efficient and quiet solution. Their existing 75 HP PD blowers were installed outdoors near the digester, uncovered and approximately 100 feet from the office and control room. The pulsing of the existing PD blowers could be heard throughout the office and control room. Nixa wanted a reliable high efficiency solution which could be utilized outdoors and without a cover. Thus, the challenge for the Nixa facility was to keep the current blower location for budget purposes but still have smoother, quieter operating blowers and use the existing MCC. The addition of a new MCC room or blower building would have made the project too expensive. 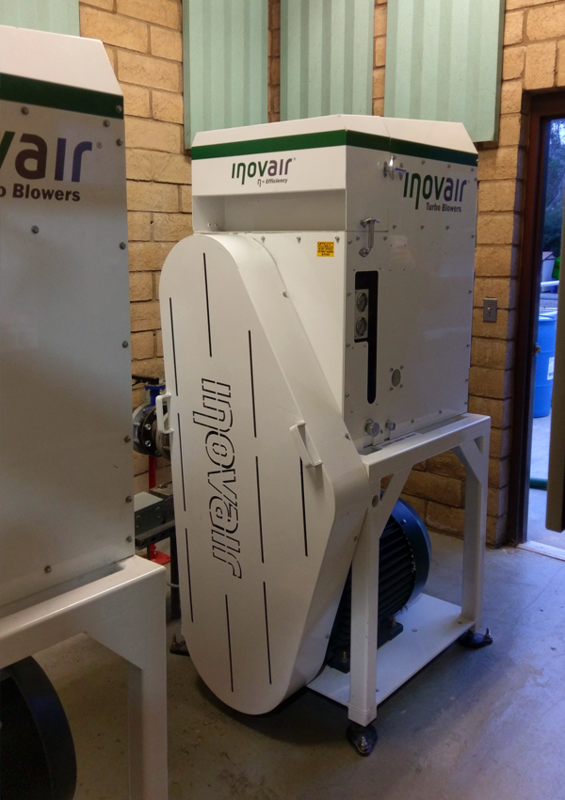 Knowing Inovair’s (IE) model integrally-geared turbo blower would provide the lowest total cost of ownership while also meeting the plants goals on noise and efficiency, Nixa worked with Inovair to apply their solution. 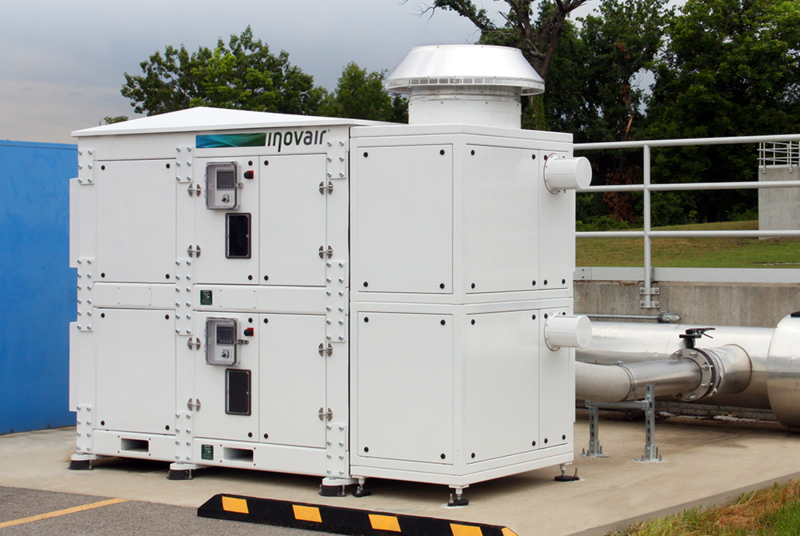 Inovair’s (IE) model integrally-geared turbo blower package was the perfect solution for Nixa. The robust (IE) integrated blower enclosure, which is designed to be installed outdoors without any additional protection or cover while also reducing sound1, was the perfect solution to meet the plant’s requirements. The plant operators were incredibly happy being able to install the new blowers in the same location while reducing the bothersome noise associated with the old blowers. The sound reduction was instantly noticed, and the plant operator remarked “We are ecstatic on how quiet they are compared to the old blowers”. A big concern for other high-speed turbo blowers is contamination from the environment such as dirt, dust, and pollen. Inovair blower packages draw the process air directly into the impeller through a filter, which removes 98% of particles 10 micron or larger, ensuring that there is no bypass air around outdated panel filters or through poorly constructed enclosures negatively affecting the life of the blower. 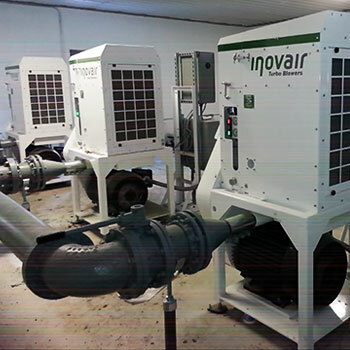 Additionally, the highly efficient air end of the Inovair (IE) model blowers allowed Inovair to meet the required flow with only 50 HP which is 33% lower HP than the 75HP required by the previous PD blowers. This highly reliable integrally-geared airhead with non-contact oil-film bearings on the high-speed shaft has eliminated any unplanned downtime and the blowers have been available for service 99% of the time. With only minor routine maintenance needed, the plant has been extremely happy with the performance and reliability of the Inovair (IE) model integrally-geared turbo blower. Nixa facility management remarked “We love how easy these are to maintain.“ An added benefit has been the realization that since Inovair uses industry standard motors the plant has piece of mind if there is ever a need to replace the motor. They could locally supply or easily service the motor. 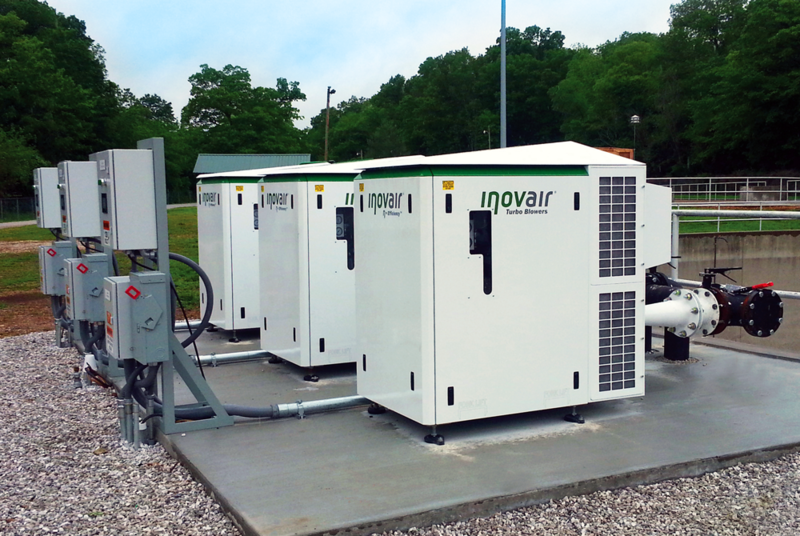 Inovair’s ability to connect to the existing MCC was crucial to avoid any budget over runs and the ability to use a lower HP due to its high efficiency ensured there were no expensive MCC room upgrades. Because of the design advantages of the this integrally-geared turbo blower package, Inovair was the only manufacturer to be able to meet all of the requirements for the Nixa WWTP plant upgrade and do it within budget. Over the last six years the Inovair blower has proven to provide the lowest total cost of ownership. A wastewater treatment plant in New Holstein, WI replaced the PD blowers utilized in thir aeration and digester processes with Inovair integrally geared turbo blowers. The PD blowers were inefficient and unreliable, at the end of their useful life. This project resulted in not only substantially energy savings and improved process control, but also substantially improved reliability. 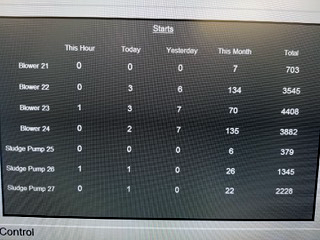 A unique aspect of the digester process was a high number of start/stop cycles, with some blowers having over 60 start/stop cycles in a single day. A case study of these blower improvements was presented at the Wisconsin Wastewater Operator’s Association conference in 2016. 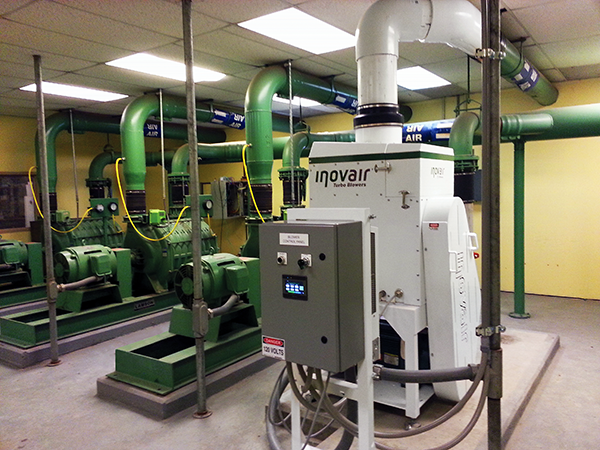 Inovair replaced an aging multi-stage centrifugal blowers in two separate applications at this New York plant. 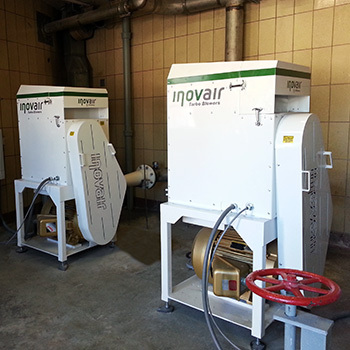 Inovair blowers operate alongside and on the same discharge header as the remaining centrifugals. With a wider turndown ability than the existing centrifugals, the Inovair blowers function as energy-saving trim blowers. Customer was looking for a cost effective solution that could provide good energy savings and a wide operational range. They are close to a residential area and need an option that was much quieter than their original PD blowers. A new lagoon process technology involves intermittent decants, requiring the blowers to start and stop multiple times per day. Inovair blowers were selected for this ability, coupled with a need to cut high electrical costs previously experienced with the original positive displacement blowers.